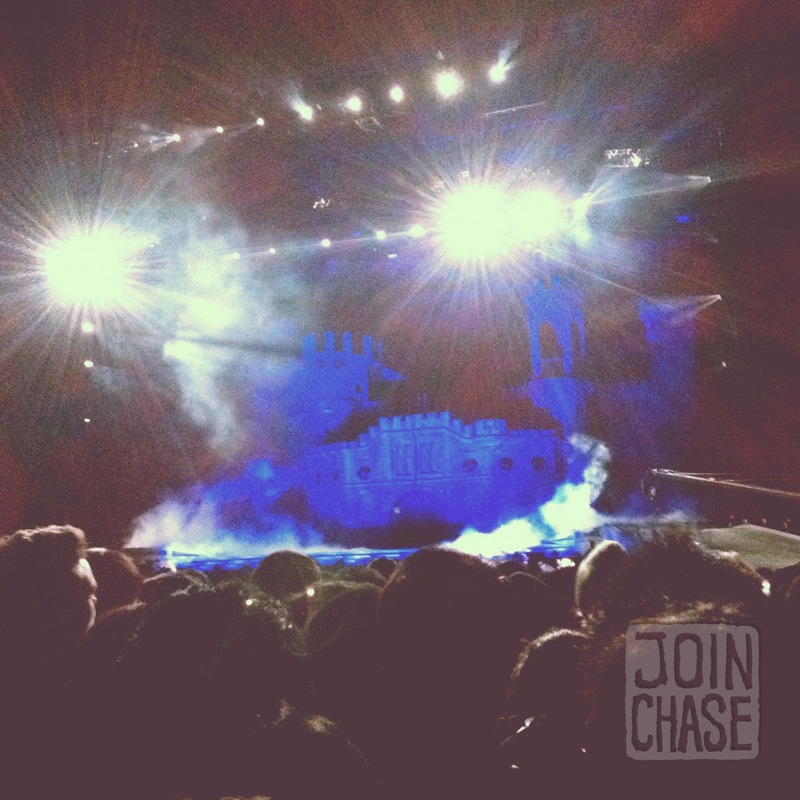 Getting to Lady Gaga was a process from the moment I tried purchasing my ticket months ago. And go figure I lost my actual ticket no more than five minutes after receiving it (an hour before the concert was to begin). Welcome to the story of my life. I requested to leave school an hour early on Friday, in order to make it in time for the Born This Way Ball. “What’s the reason?” one of my co-teachers asked. 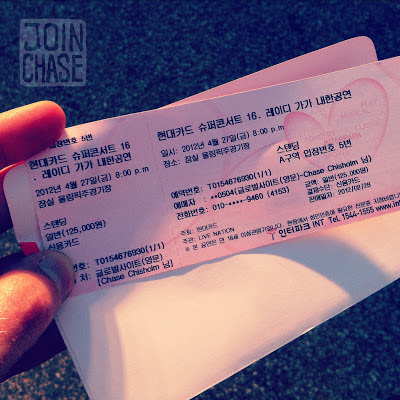 “To attend the Lady Gaga concert in Seoul,” I honestly replied. Off to a defiant start! To make the bus in time I had to purchase my ticket before school, which meant getting to the bus stop at 7AM. Did I mention I’m not a morning person? Of course I wasn’t fully packed and ready for the weekend either, so I had to sneak away from school during lunch to throw half my apartment in a carryon-size bag. Apparently Lady Gaga does influence people to do bad things. Like (kind of) lie to principals and run away from school (I live across the street). I arrived in Seoul with about an hour to spare. I needed to ditch my luggage, quickly figure out how to get to Olympic Stadium, and style my hair. The latter was of utmost importance. Somehow I managed to find a coin-operated luggage locker at the Express Bus Terminal, and kept only the necessities by my side: hairspray, hair gel, a comb, mints, mouthwash, and my iPhone. After fighting for mirror space in the men’s restroom, my hair and breath were ready for a ball. Note: When lost in an absolute mess of people in Seoul’s metro system, follow the foreigner with pink hair. She’ll lead you to Gaga. Without her obvious and outlandish style, I’d still be stuck in transit. Hoards of people in “Goo-Goo for Gaga” get-ups surrounded the stadium. I saw one protester as I power-walked through the colorful masses, but no one seemed to pay attention to him. I only stopped long enough to snap a shot. My ticket to Lady Gaga's Born This Way Ball in Seoul, South Korea. It was almost 7 o’clock. The concert started at 8PM. I still had to get my ticket, prove I was older than 17 (South Korea's government banned persons under 18 years of age from entering), and claim my spot near the stage. Getting my ticket was easier than anticipated, so I paused for a moment to breathe in the atmosphere, watch some fellow fans make fools of themselves, and snap some photos. The stage for Lady Gaga's Born This Way Ball in Seoul, South Korea. When I reached for the ticket in my bag, it wasn’t there. Perhaps I put it in a pocket of jeans. Of course it couldn't be that easy. After every empty pocket, my heart beat faster. I dug around in my bag some more, even emptied its contents. Still no ticket. By this time my heart pretty much stopped. 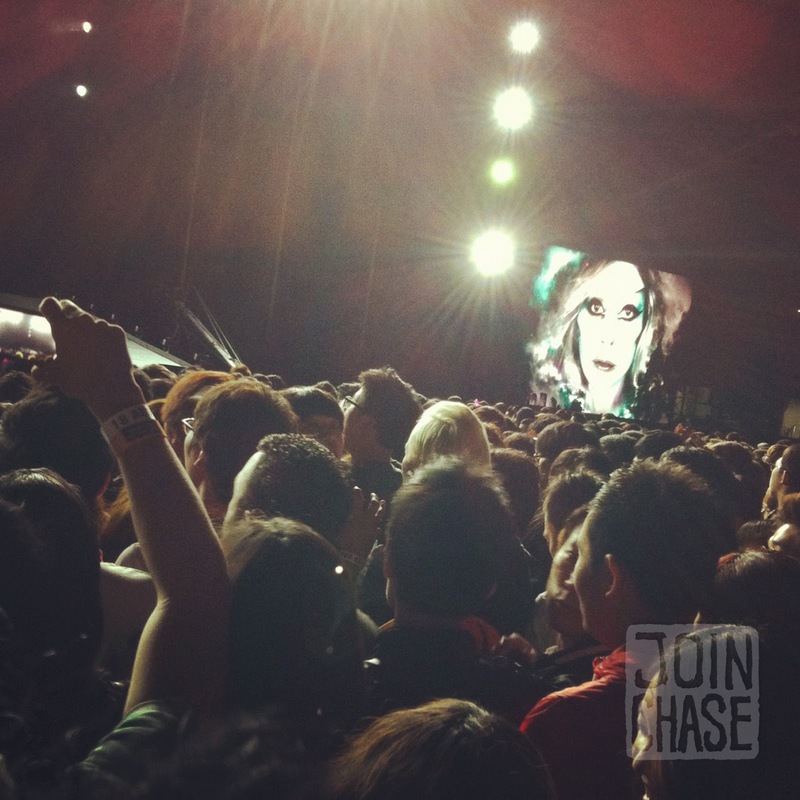 Had I lost my chance to see Lady Gaga? Did I go to all this trouble for nothing? I tried to stay calm and collect my thoughts. Where could it be? Did I leave it at the ticket counter, or drop it on the ground somewhere? Was this God’s way of answering conservative Koreans’ prayers? I kept my eyes peeled, and retraced every step. I may have gotten on my knees to say my own little prayer too. Sure enough there it was. Still inside its envelope, lying face-down in an area full of people. Losing and then finding my ticket was probably the absolute worst and best feeling I’ve ever had in my life—ever (or at least in a long time). God wasn’t punishing me after all. I’m surprised I still managed to get a decent spot after showing up so late. Many “Little Monsters” arrived during the day in hopes of gaining "Monster Pit" access, or the next closest space. Several of my friends were in the 'Monster Pit', but I was perfectly fine with my area about fifteen feet away from the walkway. According to reports, an estimated 45,000 people attended the event. Lady Gaga even mentioned something about it being the most people in Olympic Stadium since Michael Jackson’s latest performance in Seoul. 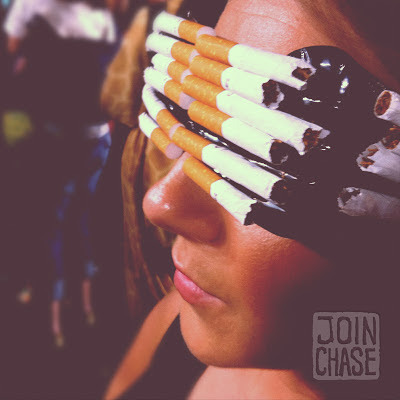 A Gaga fan wearing sunglasses covered in cigarettes in Seoul, Korea. I felt like I was part of history, like I was a part of something big. The entire experience seemed surreal. Even during the performance, I had to keep reminding myself to stop watching the screen. Lady Gaga was in front of me. I was literally close enough to see her sweat! The only thing I could’ve done without was the constant pushing and shoving of the crowd. At various points throughout the evening, I was unable to lift my arms because they seemed glued to my body. But, my favorite part about being so close to that many Koreans was getting to hear Lady Gaga lyrics sung in Korean-English accents. I enjoyed the shout-out "Mother Monster" gave to Korea by changing the words of Bad Romance from “Rah, rah, ah, ah, ah” to “Rah, rah, Ko-re-a.” And I’ve always appreciated how intimate she makes her live performances feel. I especially loved the piano rendition of Hair. What a great message! Gaga tastefully made a few remarks about the Korean government banning minors from entering the venue. However, almost immediately after making her witty comments, she told Korea she doesn’t give a [insert naughty f-word here]. It was more of a general statement about anything and everything, but the timing of it seemed ironically strategic. Even though getting to Lady Gaga was an epic journey from the beginning, all the effort was totally worth it. Apart from a few sound glitches, and an apparent injury that prevented her from saying goodbye at the end, it was a fantastic show. The stage was incredibly versatile, her costumes were just as you’d expect, and Gaga looked really good running in high heels and tights. Should you ever wonder, or care to know.